Buy one, get one for $10. 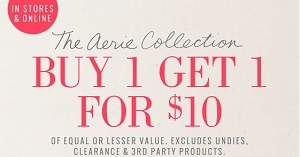 Valid at Canadian aerie stores. The second item must be of equal or lesser value. Official source of the information is aerie. More information about the promotion available at stores.